§ 55. 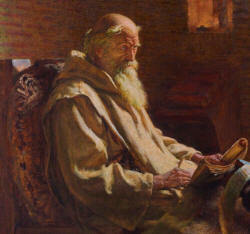 WHEN he had gone regularly through the upper districts, he came to a nunnery, which we have before mentioned, not far from the mouth of the river Tyne; where he was magnificently entertained by Christ’s servant, Abbess Verea,—a woman of a most noble character, both in spiritual and temporal concerns. When they rose from their afternoon repose, he said he was thirsty, and asked for drink. They inquired of him what he would have, whether they should bring him wine, or beer. “Give me water,” said he; and they brought him a draught from the fountain. But he, when he had given thanks and tasted it, gave it to his attendant priest, who returned it to the servant. The man, taking the cup, asked if he might drink out of the same cup as the bishop. “Certainly,” said the priest, “why not?” Now that priest also belonged to the same monastery. He therefore drank, and the water seemed to him to taste like wine. Upon which he gave the cup to the brother who was standing near, that he might be a witness of so great a miracle; and to him also the taste seemed, without a doubt, to be that of wine. They looked at one another in amazement; and when they found time to speak, they acknowledged to one another that they had never tasted better wine. I give this on the authority of one of them, who stopped some time in our monastery at Wearmouth, and now lies buried there.